Umbrella group for city centre traders does deal to cut cost of insurance for its 2,500 members after slow shopping year. DUBLIN CITY BUSINESSES have received a boost today from a new deal that will see them cut their insurance premiums by one-fifth. The Dublin City Business Improvement District group (BID) has teamed up with insurance broker First Ireland to provide a group insurance scheme for BID’s 2,500 members. The scheme promises to give the BID members a 20 per cent reduction on the cost of their existing insurance premiums. 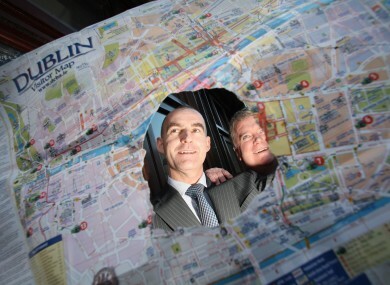 Dublin BID says that even if 60 per cent of its members avail of the scheme, a minimum of €1.2 million will be saved. The umbrella organisation for Dublin businesses says it hopes the scheme will help businesses deal with the tough current economic conditions. First Ireland has also said that it will reinvest 5 per cent of all premium income from the scheme in a fund to promote Dublin city centre as a shopping destination. This partnership with First Ireland is a significant milestone for us because it demonstrates how businesses can achieve substantial cost savings when we use our collective economic muscle to bargain together. BID is hoping that this co-op type of approach to getting group reductions might be applied to other expenses and utilites faced by their members in the future. Email “Dublin businesses strike bargain to get 20 per cent off insurance premiums”. Feedback on “Dublin businesses strike bargain to get 20 per cent off insurance premiums”.